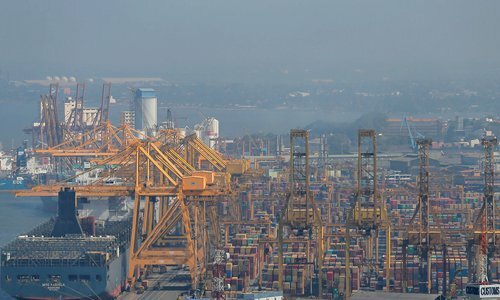 As the China-invested Colombo Port City project has completed its land reclamation, a milestone in the progress of the project, Chinese analysts said on Sunday that it is set to become a template for investment in South Asia under the Belt and Road initiative (BRI) if it develops smoothly. A ceremony held on Wednesday in Sri Lanka's capital marked the reclamation of 269 hectares of land from the ocean, and the last four state-of-the-art dredgers used for the sand mining operation left the project site, the Xinhua News Agency reported on Thursday. The process also showcased China's high-standard technology in land reclamation represented by dredgers such as "Jun Yang 1" and "Wan Qing Sha" operated by CCCC Guangzhou Dredging Co. The four big dredgers including "Jun Yang 1" and "Wan Qing Sha," with a total value of $400 million, started reclamation work simultaneously in June last year. Zhao Gancheng, director of the Center for Asia-Pacific Studies at the Shanghai Institute for International Studies, said China's technology in land reclamation is currently leading the world with strong hardware. "The completion of the first phase of the Colombo Port City project is very significant since it lays a solid foundation for further construction," Zhao told the Global Times on Sunday. Chinese Ambassador Cheng Xueyuan said at the event that "269 hectares of land were completely formed, ahead of schedule. This shows that the friendship between China and Sri Lanka has a long history and is worth more than the value of the investment," according to the Xinhua report. The ambassador added that the Colombo Port City had created more than 4,000 jobs so far for local people, benefiting thousands of Sri Lankan families. The port city, built on the reclaimed land, will accommodate 200,000 residents. It will have apartments, hotels, offices, malls and exhibition centers, and it will also provide 80,000 new jobs. It is expected to become Colombo's central business district by 2030, media reports have said. The mega Colombo Port City project, with initial investment of $1.4 billion, is being jointly developed by the Sri Lanka government and China's CHEC Port City Colombo under the BRI. It is by far the largest foreign direct investment project in Sri Lanka. Long Xingchun, a visiting senior fellow at the S. Rajaratnam School of International Studies, Nanyang Technological University, told the Global Times that the project will bring huge benefits to Sri Lanka's economic development and improvement of the city's image, which will directly help it in attracting foreign capital. "The Port City project has witnessed the down-to-earth efforts of China and Sri Lanka. If it proceeds smoothly, it will become the best case or template for other countries to invest there," Zhao said. However, Zhao noted that it's imperative for Sri Lanka to improve its business environment, which is relatively less attractive compared with other South Asian countries like India due to its limited domestic market. In addition to the Port City project, China has also invested in other infrastructure facilities. In November, a liquefied petroleum gas terminal in the Hambantota Port in the south of Sri Lanka came to mechanical completion. It was built by a subsidiary of State-owned China National Petroleum Corp. In 2017, the Sri Lanka Ports Authority and China Merchants Port Holdings signed an agreement to co-run the Hambantota Port. As China's footprint is expanding in the South Asian country, a key node along the Maritime Silk Road of the BRI, other countries such as India and Japan have also adjusted their plans in Sri Lanka. India had been pushing Sri Lanka for an estimated $1 billion contract for a second foreign-operated container terminal in Colombo, Reuters reported in November last year. For Japan, which is also increasing its port development activities in Sri Lanka, it is possible that China and Japan will reach a consensus in third-market investment in nations like Sri Lanka, which would be helpful to mitigate tensions from such major countries as the US, Zhao remarked. "If foreign enterprises from China, India or Japan can forge beneficial cooperation or competition in Sri Lanka, it will greatly benefit the country's economic development and also dispel doubts over China's engagement," Long noted.